The market is virtually overflowing with baby safe nail polish in beautiful colors that moms will enjoy using to paint their baby girls' fingers and toes. Manicures will be much more fun without the worry that they may be exposing babies to harmful chemicals in the polish or the remover. It's a fact that moms are divided on the issue of painting a baby's fingernails even with chemical free nail polish. Infants tend to keep their little fingers in their mouths and (no judgement here, ladies) I waited to paint my baby girl's nails until she was nearly two years old. I painted her toes a few times when she was going to wear sandals since it would be more difficult (I didn't say impossible!) to chew the polish off. After she was past the finger chewing stage, she actually started to ask for me to paint her fingernails as well as her toenails. Little girls love to have pretty colors on their hands and feet just like big girls! It became a grooming ritual after her bath for her to sit and have her nails trimmed in preparation for them to be painted a pretty shade of pink! To paint or not to paint as well as at what age to paint is a personal decision but I feel better knowing that the moms who like for their baby girls to wear nail polish will have a better product available that may reduce their chemical exposure. 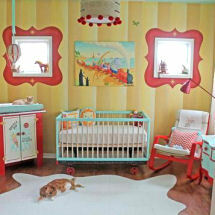 Return to find more nursery ideas and the latest information on baby safe nail polish.